Count Leo Tolstoï (1891). 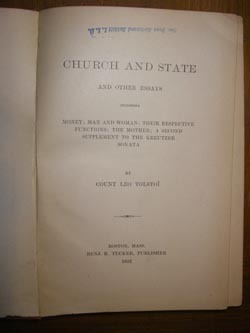 Church and State and Other Essays. Boston, Mass. : Benj. R. Tucker, Publisher. FAITH is that which invests life with meaning, that which gives strength and direction to life. Every living man discovers this meaning and lives upon it. Having failed to discover it, he dies. In his search, man avails himself of all that humanity has achieved. All that has been achieved by humanity is called revelation. Revelation is that which helps man to comprehend the meaning of life. Such is the relation of man to faith. What a wonderful thing, then! Men appear, who toil unceasingly to make other people enjoy just this and no other form or revelation; who cannot rest until others accept their, just their form of revelation, and who damn, execute, kill, as many as they can of the dissenters. Others do the same: damn, execute, and kill one another. At first it was amazing to me how such an evident absurdity, such an evident contradiction, failed to destroy faith itself. How could there remain people who believed in this delusion? And indeed, from a general point of view, this is inconceivable, and irresistibly proves that every faith is a lie, and that the whole thing is superstition -- which is what the reigning philosophy does prove. Looking from the general point of view, I too had irresistibly been driven to the admission that all faiths are human delusions; but I could not fail to pause at the reflection that the very silliness of the delusion, its manifestness, and the fact that nevertheless humanity submits to it. -- that this very thing proves that at the foundation of this delusion rests something that is not a delusion. Otherwise, it were all so foolish that people could not deceive themselves. The very submission of entire humanity, which truly lives, to the delusion, obliged me to acknowledge the significance of that phenomenon which is the cause of the delusion; and upon this conviction I began to analyze the Christian doctrine, which serves as the foundation of the delusion of entire Christian humanity. So it appears from the general point of view; but from the personal point of view, from that inconsequence of which every man (and I), in order to live, must have faith in the meaning of life, and has such faith, -- that fact of compulsion in the matter of faith is still more amazing in its absurdity. Really, how, why, to whom, can it be necessary that another should not only believe, but profess, in the same way I do? A man lives, consequently he knows the meaning of life. He has fixed his relation to God; he knows the truth of truths, and I know the truth of truths. The forms of these may be different. The substance must be one and the same, -- we are both men. How, why, what may compel me to demand from anybody that he shall manifest his truth absolutely as I do? Faith in his life, -- how then can I take away his faith and give him another? It is like taking his heart out and putting another in. I can only do it if faith, his as well as mine, is -- words, and not that whereby he lives; if our faith is an excrescence, not the heart. Another reason why this cannot be done is that it is impossible to force a man to believe that which he does not believe, -- that is, to fill his relation to God, -- and because he who knows that faith is the relation of man to God cannot wish to determine the relations of another man to God through force or fraud. This is impossible, but is done and has been done everywhere and always; that is, it could not be done, since it is impossible, but something is being done and has been done that is very much like it. What is being done and has been done is the imposing by some on others the likeness of faith, and the acceptance of this likeness of faith by the others, -- likeness of faith, -- that is, the delusion of faith. Faith cannot impose itself, and cannot be adopted for the sake of anything, -- violence, deception, or utility; and hence it is not faith, but the delusion of faith. And this delusion of faith is the ancient condition of the life of humanity. In what, then, does this delusion consist, and on what is it founded? What produces it in the deceivers, and what sustains it in the deceived? I will not speak about Brahminism, Buddhism, Confucianism, Mohammedanism, in which the same phenomena have taken place; not, however, because the same would not be found to be the case. To every one who has read about those religions it will be clear that with those faiths it is the same as with Christianity. I will speak exclusively about Christianity, as a faith familiar to us, needful and dear to us. In Christianity the whole delusion is built on the fanatical idea of Church, based on nothing, and astounding, at the commencement of the study of Christianity, in its unexpected and useless absurdity. Of all the godless ideas and terms, there is no term and concept more godless than the idea of Church. There is no idea that has produced more evil, no idea more hostile to the doctrine of Christ, than the idea of Church. At bottom, the word Ecclesia means collection and nothing more, and so it is used in the Gospels. In the languages of all new peoples the word Ecclesia signifies house of worship. Further than these significations, in spite of the fifteen centuries' existence of the delusion of Church, this word has not advanced in any language. "Everything I am about to say is truth, and, if you will not believe, I shall burn you, or damn you, and in every way work you injury." This idea is a sophism, necessary for certain dialectical purposes, and it remains the inheritance of those who need it. Among the people, and not only among the people, but in society, and among educated men, in spite of the fact that the Catechism teaches it, this idea does not exist. This definition (however ashamed one may be to analyze it seriously, it has to be done, seeing that so many people put it forward as something important) is totally false. When it is said that the Church is the congregation of the truly-faithful, nothing is really said; since, if I say that a chapel is the congregation of all true musicians, I say nothing if I do not declare whom I call true musicians. While, according to theology, the truly-faithful are those who follow the doctrine of the Church, -- that is, are in the Church. To say nothing of the circumstance that of such true faiths there are hundreds, the definition tells us nothing, and would even seem useless, did not the trace of a certain ear-mark become perceptible here. "By God, Everything We are Going to Say, everything is genuine truth." The whole delusion is here, in the word and in the idea, Church. And the delusion only signifies that there are people who have an immoderate desire to teach their faith to others. But for what end do they wish so strongly to teach others their faith? Did they possess genuine faith, they would know that in faith is the meaning of life, the relation to God, fixed by every man individually, and that it is therefore impossible to teach faith, but only the delusion of faith. But they desire to teach. The simplest answer would be that the Pope needs cake and eggs, the bishops a castle, fishpie, and a silken cassock. But this answer is insufficient. Such, no doubt, is the inward, psychological motive of the delusion, the motive maintaining it; but, reasoning thus, how could one man (executioner) venture to kill another against whom he has no malice? It would be inadequate to say that the executioner kills because he is not given brandy, a loaf of white bread, and a red shirt; just in the same degree would it be inadequate to say that the Metropolitan of Kieff and the monks fill asks with straw which they call saints' relics, just for the sake of getting an income of thirty thousand. Both acts, the one and the other, are too terrible and repugnant to human nature to allow such an explanation to be adequate. As the executioner, so the Metropolitan, in explaining his act, will cite a whole series of proofs, the chief basis of which will be historical tradition. "It is necessary to execute men; since the world came into existence there have been executions. If not I, then somebody else. I will do it, I hope, with the aid of God, better than another," will say the executioner. "Formal worship is necessary; since the world came into existence, the relics of the saints have been honored," will say the Metropolitan; "the relics of the caves are honored; people come here. If not I, then somebody else will play the host here. And I, with the aid of god, hope to dispose of the money, got by blasphemous fraud, in a way more pleasing to God." To understand the delusion of faith, it is necessary to go to its source, to the origin. We speak of that which we know in reference to Christianity. Turning to the original Christian doctrine in the Gospels, we find a doctrine directly excluding formal worship, censuring it, and one that with particular plainness and positiveness denies all teaching. This deviation begins at the time of the apostles, especially with that lover of teaching, Paul: and the wider Christianity extends, the more it deviates and appropriates the methods of that very external worship and dogmatism the denial of which was so positively expressed by Christ. But in the first days of Christianity the idea of Church is used only as a representation of all those who share the faith which I consider the true one. A wholly true idea, provided it does not include mere verbal manifestations of beliefs (but expressions y means of the entire life), since beliefs cannot be manifested by words. The conception of the true Church was also used as an argument against the opponents; but until Emperor Constantine and the Nicaean Council, Church was only an idea. But since Constantine and the Nicaean Council the Church has been a thing, and a thing of fraud. The Fraud begins with the Metropolitan and the relics, the priests and the Lord's Supper, Synods, and the like, which so astound and horrify us, and which, from their ugliness, do not find an adequate explanation in the mere advantage derived by those persons. The delusion is old, and did not proceed from the mere advantages to private persons: there lives no such man, monster, who would determine to do it if he were the first and if there were no other causes. The causes that led to it were bad ones. "By their fruits shall you know them." Power: Constantine, emperor, according to heathen ideas one who stands at the height of human grandeur ( he was counted among the gods), accepts Christianity, furnishes an example to the whole nation, converts the nation, and extends a helping hand as against heretics, and through the ecumenical council fixes the unitary orthodox Christian faith. Charles the Great, Vladimir, continue the same work. And the delusion has continued up to our time, the delusion being right here, - for the acceptance of power by Christianity is needful for those who understand the letter, but not the spirit, of Christianity. In reality, the acceptance of Christianity without the repudiation of power is a mockery and pervesion of Christianity. The consecration of governmental power by Christianity is blasphemy, is the doom of Christianity. Having lived fifteen hundred years under this blasphemous union of pretended Christianity with Government, it is necessary to make a great effort in order to forget those intricate sophisms which for fifteen centuries, everywhere, at power's pleasure, have perverted the doctrine of Christ, to make it compatible with Government, and the attempts to explain the sacredness, legitimacy of Government, and the possibility of its being Christian. At bottom, the words, "Christian Government" are like the words, "warm, hot ice." Either there is no Government, or there is no Christianity. To understand this clearly, it is necessary to forget all those phantasies in which we are carefully educated, and plainly inquire into the import of those sciences, historical and judicial, which we are taught. These sciences are without any foundations; all these sciences are nothing else from an apology for violence. Passing by the history of the Medes and Persians, etc., let us take that Government which first made a union with Christianity. There was a cut-throats' nest in Rome. It spread by robbery, violence, murder. In conquered nations. The robbers and their descendants, with chiefs (who were called, now Caesar, now Augustus) at their head, plundered and tortured the people to gratify their desires. One of the descendants of these cut-throats, Constantine, having read a great deal in books and having become satiate with his voluptuous living, preferred certain dogmas of Christianity to previous beliefs; to the bringing of human scarifies, he preferred grand mass; to the worship of Apollo and Venus and Jupiter, he preferred the one God, with his Son Christ; and he ordered the introduction of this faith among those who were under his authority. "Kings rule over their peoples; this shall not be among you. -- Do not kill. -- Do not commit adultery. -- Abjure riches. -- Do not judge; do not condemn. -- Endure evil." All of this nobody told him of. "Oh, you wish to call yourself a Christian and continue to be the chief of the cut-throats, -- to assault, burn, fight, do mischief, execute, and revel? All right!" And they furnished him a Christianity, and made it very comfortable, -- better than could have been expected. They anticipated that he might, on reading the Gospel, bethink himself that there more is demanded of him than the building of churches and the visiting them, that a Christian life is there required; and they thoughtfully and with foresight constructed such a Christianity for him that he could without embarrassment live in the old, heathen way. On the on eland, Christ, the Son of God, appeared for no other purpose than to redeem him, Constantine, and all the others. Because Christ died, Constantine can live as he pleases. And if this is not enough, one may repent and swallow a piece of bread with some wine; -- in this there will be salvation and all will be forgiven. And not satisfied with this, they even consecrated his ruffianly power, and said that he was from God; and anointed him with oil. For this he, too, arranged for them as they desired. He called a council of priests, had them declare what the relation of every man should be to God and every other man, and the same he ordered to be repeated. And all were satisfied; and thus for a thousand years has this faith lived in the world, and other cut-throat chiefs have introduced it, and they are all anointed, and everything, everything, is from God. If some villain plunders everybody, massacres many people, he will be anointed by them, -- he is from God. Some nations have had husband-slayers and libertines. The French have had Napoleon. And the priests, in compensation for this, not only are from God, but almost are themselves gods, since in them resides the Holy Ghost. He resides in the priests as well as in the Synod, with its commanders, the officials. And as soon as a certain anointed -- that is, a cut-throat chief -- becomes possessed of the desire to massacre another as well as his people, holy water is at once made fro him, some of it is sprinkled, the cross is taken up (that very cross carrying which Christ died, because he repudiated these very cut-throats), and a blessing is bestowed on massacre, hangings, and beheadings. And everything would be well; but even here they could not agree among themselves, and the anointed proceeded to call each other cut-throats )that which they really are), while the people began to listen and ceased to believe either the anointed or the keepers of the Holy Ghost, but learned from their own lips to call them by their real names, as they themselves call each other, -- namely, cut-throats and imposers. But to the cut-throats we have only referred a propos, since they had traduced the impostors. Our talk is properly about the impostors, the pretended Christians. Such they have become in consequence of the union with the cut-throats. And it could not be otherwise. They deviated from the path at the first minute that they consecrated the first Emperor, and assured him that he could help the faith with his violence, -- the faith of humility, self-denial, and the endurance of injury. The whole history of the actual Church, -- not the fantastic, -- that is, the history of the hierarchy under the authority of the emperors, is a series of vain attempts on the part of this unfortunate hierarchy to preserve the truth of the doctrine, while propagating it by means of lies and abjuring it in practice. The importance of the hierarchy is based only on the doctrine which it intends to teach. The doctrine speaks about humility, self abnegation, love, destitution; but the doctrine is propagated by violence, hatred, and evil. That the hierarchy may have something to teach, that there may be disciples, it is needful not to forsake the doctrine; while in order to whitewash itself and its illegitimate union with power, it is necessary to disguise by the shrewdest considerations the substance of the doctrine and to transfer for the purpose its centre of gravity, from the substance of the doctrine to its formal side. And this is what the hierarchy is doing, -- this is the source of that delusion of faith propagated by the Church. The source is the union of the hierarchy with violence under the respective names of Church and power. As to the source of people's desire to teach their faith to others, it is found in the fact that faith unmasks them, and they are obliged to substitute, in place of genuine faith, one of their own invention, to be justified by it. Genuine faith may exist everywhere except where it is obviously false, - that is, addicted to violence. Everywhere, but not in Government-imposed faith. Genuine faith may exist in all so-called schisms, heresies, but certainly cannot exist only where it is united with Government. Strange to say, but the appellations, orthodox, Catholic, Protestant faith, as these words are fixed in common speech, signify nothing else than faith united with power, Government faith, and hence false. The conception of Church, -- that is, unanimity of many, of the majority, and at the same time the proximity to the source during the first two centuries of Christianity, -- was but one of the weak formal arguments. "I know from Christ himself." "We think rightly, and the proof of this is that there is a large congregation of us,Ecclesia, Church." But only after the Nicaean Council, arranged by the Emperor, did the direct and conscious delusion begin for a part of those who professed the same faith. "it pleases us and the Holy Ghost," they began to say then. The conception of Church became not merely a poor argument, but also, for some, a power. The Church united with power, and began to act as a power. And everything that united itself with power and yielded to it ceased to be faith, and became delusion. What does Christianity teach, whether understood as the doctrine of a given church, or of all churches? 1. The doctrine of dogmas, beginning with God's Son, Holy ghost, and the relation between these personalities, down to the Lord's Supper, with or without wine, with fresh or sour bread. 2. And the moral doctrine, -- humility, indifference to wealth, bodily and spiritual purity, charity, emancipation from slavery, bonds, and worldliness. Notwithstanding all the efforts of the Church to blend these two phases of the doctrine, they never intermix, and, like oil and water, have always kept apart from each other in large or small drops. The difference between these two sides of the doctrine is clear to every one, and every one may trace the fruits of one and other side of the doctrine in the lives of nations, and from these fruits may conclude which side is the more important; or, if one may say truer, then which one is the truer? Glance at the history of Christianity from this side, and a terror will come upon you. Without exception, from the very beginning to the very end, to our time, wherever you will look, whatever dogma you will glance at, even at the first, - the dogmas of the divinity of Christ, -- and down to the communion, with or without wine, the fruits of all these intellectual labors upon the elucidation of dogmas are: malice, hatred, executions, expulsions, the massacres of wives and children, stakes, and tortures. Look at the others die, -- the moral doctrine: from the retiring to the desert for communion with God, down to the custom to carry loaves of bread to the prison, the fruits of this doctrine are all our ideas of good, all our joy, consolation, and light. Those men before whose eyes the fruits of the one and the other have not yet clearly manifested themselves could fall into error, could only fall into error. Those, too, could fall into error who were sincerely carried away by the disputes about dogmas, not perceiving that they, by these dogmas, not perceiving that they, by these dogmas, served the devil, not God, not noting that Christ explicitly said that he had come to destroy all dogmas. Those, too, could fall into error who, having inherited the traditions about the importance of those dogmas, received such a wrong mental training that they cannot see their mistake. Those, too, may err who are ignorant and to whom these dogmas represent nothing but words and fantastic images. But we, to whom is open the original meaning of the Gospels, which denies all dogmas; we who have before our eyes the fruits of these dogmas in history, we may not err. History is for us the test of the truth of the doctrine, a test almost mechanical. The dogmas of immaculate conception, is it needful or not? What has resulted from it? The doctrine that the adulteress is not to be condemned, is it needful or not? Thousands and thousands of times have men been mollified by this reminder. Another consideration. Take any dogmas whatever, are all agreed upon it? No. And about giving to him who begs? Thus, the first, the dogmas, on which there is no agreement, which nobody needs, which ruins men, -- this the hierarchy has advanced and is advancing as the faith; while the second, that on which all are agreed, which all need, and which saves men, -- this, though the hierarchy has not dared to deny it, it also has not dared to advance as the doctrine, for this doctrine denies the hierarchy itself.